Setup a secure encrypted vault, permissions, users, and structure and use two-factor for robust authentication. Enforce least privilege and separation of duties on privileged accounts, and ensure proper protection with password management software. Easily automate privileged password changes on a schedule based on your organization’s security policies. Built in password changing and expiration schedules ensure critical passwords are changed without manual intervention. Quickly scan your network to find and take over privileged accounts with automatic Discovery. Find vulnerable, unmanaged privileged and shared accounts. Discovery can automatically find accounts and map existing secrets to those accounts. Utilize dozens of out-of-the-box reports to assist with security, system health, and compliance. Produce full audit reports on vault activity. Easily create a custom report with database queries. Maintain accountability and guarantee that approvers know why a user needs access. A user must be granted approval to access a password. Users must request access for a set amount of time and cannot use the password until approved. IBM Security Secret Server integrates across the IBM Security portfolio, featuring key use cases with IBM Security Identity Governance & Intelligence, Cloud Identity, Guardium Data Protection and QRadar. Maintain a full audit trail for your critical systems through session monitoring. If someone adds a backdoor account or makes an unauthorized configuration change, you can identify who accessed the system, quickly review what they did and react accordingly. Often, organizations don’t know what privileged accounts exist, or where they’re stored, so they can’t secure them against hackers or insider threats. 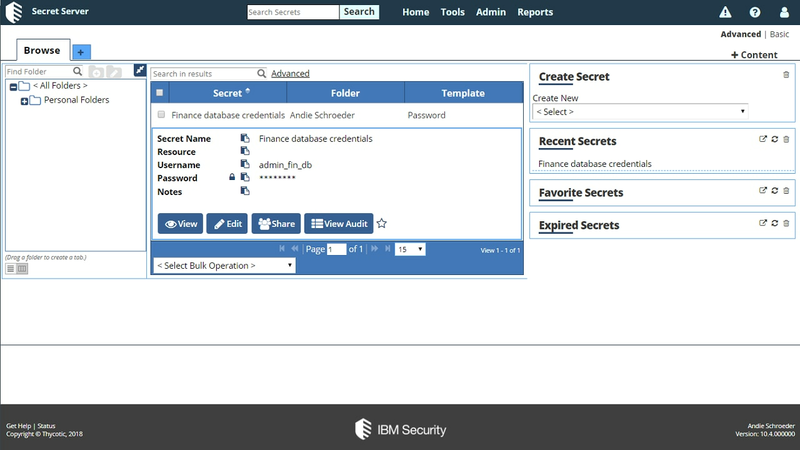 With IBM Security Secret Server, organizations can use Discovery to automatically find privileged accounts and bring them into the vault, to ensure their privileged accounts are secure and compliant. Shared credentials to privileged accounts, such as admin accounts, are often written down on post-it notes or shared spreadsheets. Yet these same credentials unlock organizations’ most critical assets. With IBM Security Secret Server, organizations gain full control over which users have access to which privileged credentials, and how they can use those credentials. With shared accounts, it can often be difficult to know exactly who is accessing your systems and data. If someone adds a backdoor account, makes an unauthorized change, or takes some other risky action, it can be difficult to trace who did what. With IBM Security Secret Server, you can monitor and record privileged sessions so you know every keystroke a user takes for comprehensive audit and forensics.